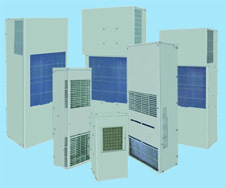 Kooltronic, Inc., of Pennington, NJ, announced additions to their 480V Panel Mounted Air Conditioners designed to cool the interior of electrical/electronic enclosures. These new models have expanded the Series capacity to 5,000 to 26,000 BTU/H, available in either NEMA 4 or 4X, 480 Volt. These air conditioners are ideal for both indoor and outdoor applications where weather or corrosion resistance is required. The Guardian Series models feature epoxy-coated condenser coils and painted galvanized sheet metal and can be used in wash down and outdoor environments. The GuardianX Series adds a stainless steel shell which makes these models ideal for applications such as Food and Beverage processing plants and electronic systems that need to be housed in 4X rated enclosures. All models are UL/CUL Listed and use either environmentally-friendly CFC-free R134a or zero ODP R410a refrigerant.